Moth numbers have increased since the week of June 12, specially in the Colusa trap. 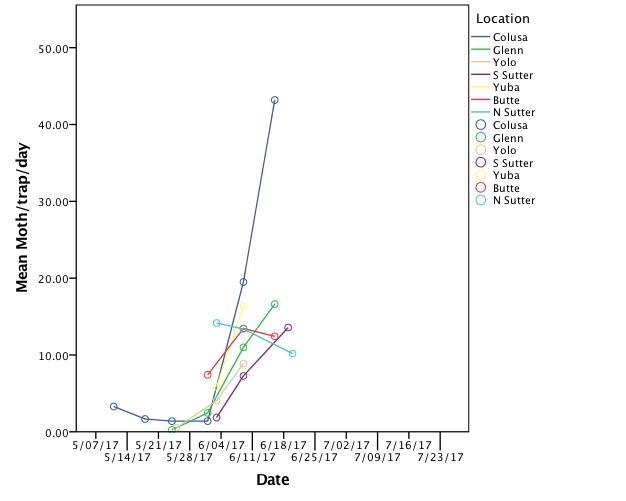 The degree day model predicted worms in the fifth instar by June 22; I'm starting to receive reports of worms in Colusa, Glenn and Butte counties. Keep your eyes on the field; heat speeds up development and worms may show up earlier. If moth numbers continue to increase, we may have a longer period of worm infestation ahead of us.